UBC Library’s LibQUAL+® survey results have been released, including a summary of suggested priority areas for further exploration. A subset of results from 2007, 2010 and 2013 are also available online in an interactive visualization that illustrates how perceptions of the Library have shifted over time for undergraduate students, graduate students and faculty. Among the top priorities identified in the 2013 survey is off-campus access to electronic resources. In direct response to this user feedback a working group of Library staff members is actively exploring ways to improve remote access to UBC Library electronic collections. LibQUAL+® is one of the methods UBC Library uses to stay in touch with student and faculty priorities and to monitor our progress. Other surveys complement and provide context for interpreting LibQUAL+® and strengthen evidence for decision-making. The Student Senate Caucus UBC Library Survey is one of these such surveys, and the results can now be viewed on the Alma Mater Society of UBC Vancouver (AMS) website. Questions about LibQUAL+® and requests for more information can be directed to Jeremy Buhler, Assessment Librarian, at jeremy.buhler@ubc.ca. This month’s issue of LibFOCUS is packed with things to do at UBC Library this month, including tours, exhibits, Asian Heritage month events and a survey to take. The readership survey ends May 21, 2013. UBC Library is once again participating in the LibQUAL+® survey, which gathers feedback on Library collections, services and spaces. The web-based survey was sent to a random sample of students and faculty on February 12, 2013. 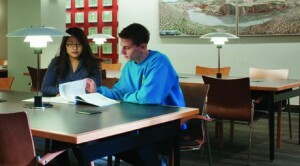 LibQUAL+® closes on March 4, 2013, and the Library will share survey results with the campus community by Fall 2013. LibQUAL+® is an internationally recognized survey used by more than 1000 libraries to measure service satisfaction among users, and to better understand and respond to user expectations. UBC Library last ran LibQUAL+® in 2010, and in 2013 we join a consortium of nearly 50 Canadian academic libraries using the survey to better understand and respond to student and faculty expectations. More information about LibQUAL+® is available on the Library’s About Us site, as well as answers to FAQs. Do you use software to manage your citations for research papers? Like RefWorks, Zotero, Mendeley, EndNote? We want to hear from you! 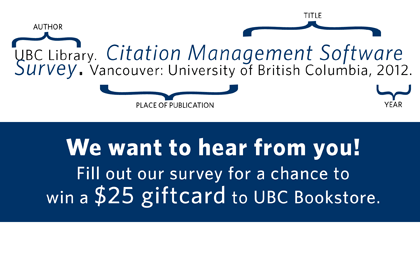 Fill out our Citation Management Software survey for a chance to win a $25 giftcard to UBC Bookstore. UBC Library offers instruction and online tutorials for using citation management software. The survey results will help us determine which software is being used, and how the Library can best offer support and instruction. Survey closes May 25. For further information or posters, contact Library Communications. 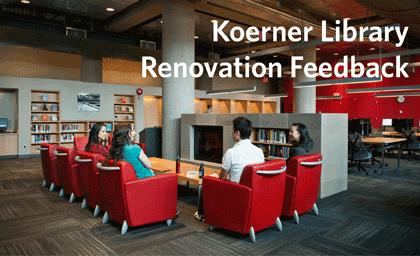 As part of UBC Library’s commitment to enhance student spaces, we have recently renovated the third level in Koerner Library. We are now looking for feedback from our users on whether the space meets their needs. The Library has released a multiple part survey, asking a series of questions on four different days to assess your satisfaction with the newly renovated space. The questions will be released on April 12, 13, 16, and 17. Survey respondents will have the opportunity to enter to win a $25 iTunes giftcard. However, responses will only be counted once per question, to a total of four possible entries. Part 1 – April 12 - Thanks for responding! Part 2 – April 13 – Thanks for responding! Part 3 – April 16 – Thanks for responding! Part 4 – April 17 - Thanks for responding! The new Koerner space, which opened to the public this week, features more user-centered spaces to promote informal learning and collaboration. For questions about the survey, contact Library Communications. 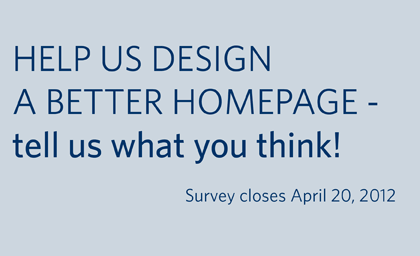 The Library is looking for feedback to improve its homepage design. The Web Services Working Group has developed a survey which is open to all members of the UBC community (students, faculty, staff, alumni and those with an affiliation to the University). The feedback gathered will be used to help in the redesign of the Library’s current homepage. The survey consists of ten questions and should take about ten to fifteen minutes to complete. Those wishing to provide additional feedback are encouraged to contact John Chan, Library Systems and Information Technology, for future opportunities- including usability testing and card sorting exercises which will begin mid-April.